There were rainbows, thunderstorms, and finally a beautiful break in the weather. There was the boys and girls Nat Holman Basketball Tournament, and a newly-created divisional evening activity (essentially a Fortnight-themed Manhunt that just might challenge Human Stratego as the favorite night program in the year-end camper surveys). There were divisional overnights and hikes; a Soph Titanic theme day (division leader Jamie Hamburg as the Iceberg); an Inter (girls) Pirate theme day complete with treasure hunt and "X marks the spot" cookie making; a first outing to the local golf course; “NFL Combines”; Rope Burns; Tribes days; Birthday Ball; and an American Idol competition. 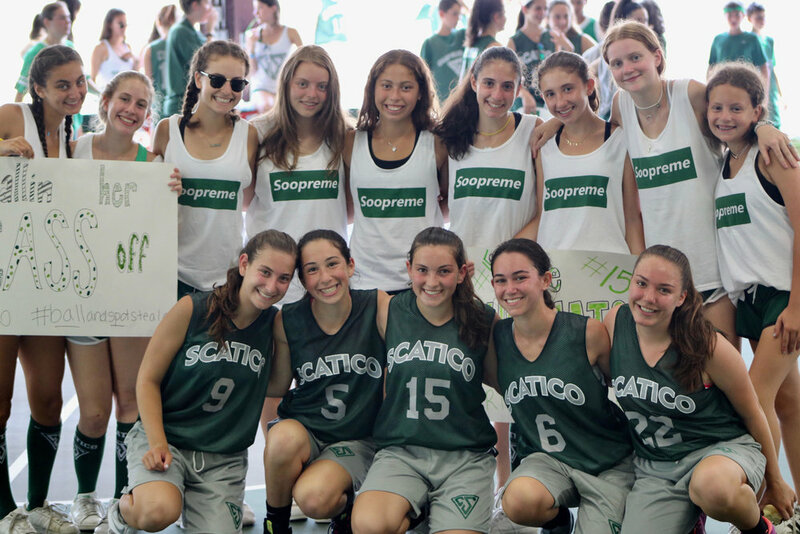 On back-to-back Monday's-- July 9th and 16th-- Scatico got decked out in green, green, GREEN for the boys' and girls' Nat Tournaments! Invitees included Camp Pontiac, Camp Wah-Nee, Camp Eagle Hill, Camp Kinder Ring, and Berkshire Hills Camp. On boys side, as is tradition, before the tournament started the entire boys camp gathered in the "K Corner" to cheer, jump, blast music and get hyped. While we lost our first game against Wah-Nee, we bounced back and were able to beat Berkshire Hills Camp in our second game. It was boys first Nat tournament with the new A-court bleachers (that have a backing to avoid losing constantly rolling balls) and they were deemed a success! For the girls Nat, our team played an incredibly impressive four games! Due to the fact that there were an even number of teams, and several won their first game but lost their second, the girls Nat had to participate in a series of 5-minute 1-quarter games to make it on to the finals. Ultimately, after two intense games, Scatico lost to Pontiac in the finals by a mere two points. Shortly after the Nat, the Pavillion was converted for an entirely different activity use: DJ PURE!! One of the highlight nights of the summer, DJ Pure is a full-on dance night with boys and girls of all divisions. Complete with lights and many-a-Scatico shoutout, Scatico campers and counselors danced all night long and even managed to coordinate a full-camp Cotton-Eyed Joe! A song that is (shockingly) beginning to stand the test of time. Over the past two weeks boys side has several full-camp evening activities. On Visiting Day evening, the entire boys camp had a BBQ on the ballfields, followed by the annual “Scatico Legends” story-telling competition. For the event, all campers and counselors are divided into four teams: Guardians, Harbingers; Seers, and Alchemists (your team for your entire Scatico career). Inter Division Leader Zach Wayne finished in first place (for the Alchemists—a story about a bee that wanted to become a squirrel), but campers Jake Zirolli, Elias Halperiin-Ranzer, and Jared Pisetzner also captivated the camp with their tales. 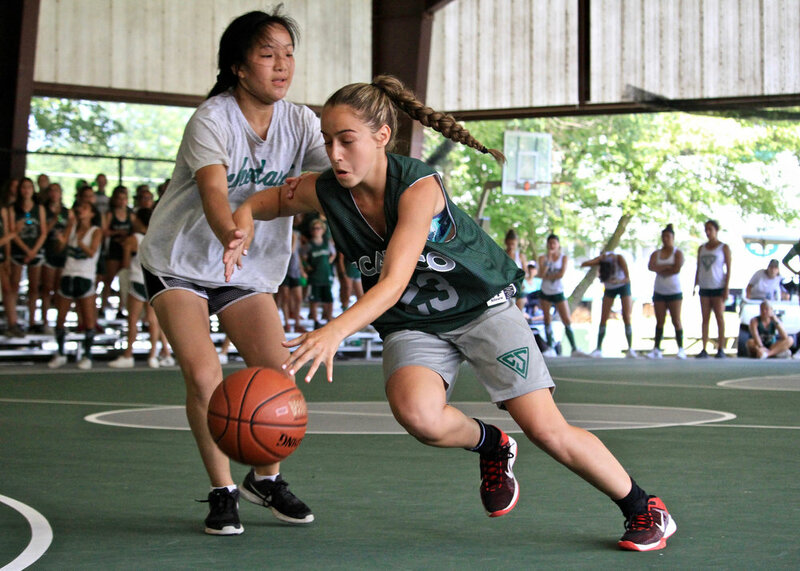 Other highlights over the past two weeks included Intercamp Tournaments in archery, swimming, flag football, basketball, baseball, tennis, and soccer; and the start of the Intramural Lower Hill Twilight League Playoffs in baseball, basketball, and soccer. Six camps participated in Scatico’s Annual Chess Tournament, and Scatico had a strong second-place showing, including first-place finishes on “boards” by Jack Wasserman, Ryan Derasse, Oz Rubinson, and Josh Mazarin; and second-place finishes by Tommy Hall and Michael Fischgrund. There was a full-camp evening game show night—“The Price Is Right”—where campers guessed the actual price on a variety of camp items, from a pint of milk to a 1-day golf cart rental to the Mets seats on the HC porch. Filming also began on the production of “The Wizard of O.D.” (as in “On Duty” for bunk coverage at night). Free time? Think endless games of Chicago and 42 on the basketball courts or chess and card games of Kent (a summer 2018 sensation) on the HC porch and bunk picnic tables. Girls side celebrated its own time-honored tradition last week... Birthday Ball! A full girls' side birthday celebration, for Birthday Ball all girl side campers and staff are split into the four season, based on when they were born. Each season then comes up with a creative "theme," and designs costumes and scenery to deck out the dining hall for the occasion. This year's particularly creative themes were Kerri Winter-man (who dressed in typical head counselor Kerri gear, such as Michigan hats, sweats and white tees), Summer Interns (who donned ties and name tags), Poland Spring (sported green and blue), and Fall-y-wood (Lower Hill dressed as celebrities and upper hill as the paparazzi). The birthday ball "party favor" was a Scatico hat, and the evening ended (as it always does) with a lighting of one giant birthday cake with 98 candles (one for each summer Scatico has existed). 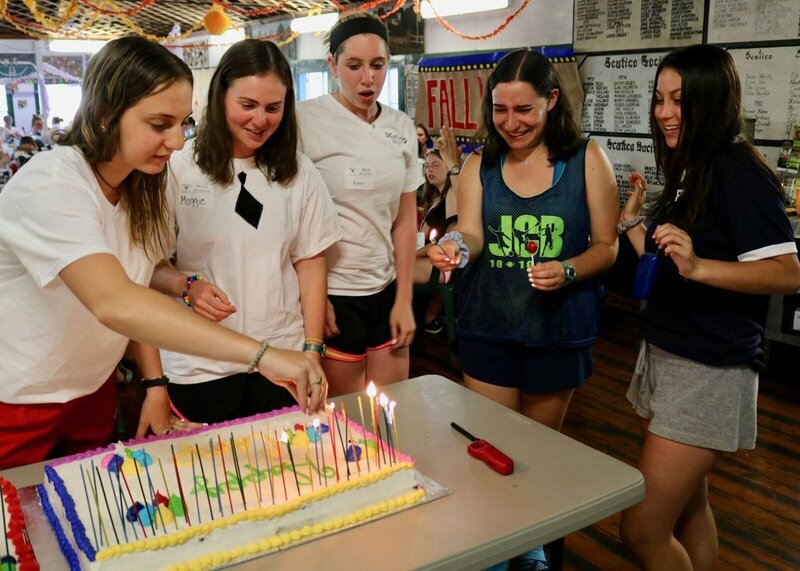 As is tradition, candles are lit by the counselors and campers who have been at camp the longest-- starting with Diana and Kerri (who have over 20 years at Scatico each) down to DLs Emily Berger, Lexi Schecter and Katie Hecker (over 10 summers each), and eventually down to Junior Counselors. Other girls side highlights, included the final Tribes day-- complete with the "Peanut Hunt" (now a dog biscuit hunt), a revealing of the Plaques, and performing of the Aerobics routines and Folk songs-- the Jinter/Juniot/ Senior show of "High School Musical"; and the "Miss Ugly" pageant won by CIT Amanda Graf! With only three weeks left in the summer, campers and staff alike know the best is yet to come: Minicamp; Carnival; Divisional Trips; Sing; the Art Show and Open Mic Night; Twilight League Playoffs; and Color War. That’s a lot to pack in…. And still the most cherished and memorable moments remain the in-between times when campers foster friendships and fully embrace the magic of the camp community.